El Paso Zoo Might Name Cockroaches After The President This Valentines Day? If you watched the State of the Union this year, you most likely became aware of the falsehoods espoused by the president in regards to the town of El Paso. The motive of using this falsehood was to support the president’s signature campaign promise to build a wall on the southern border of the United States. That was not the first time Trump denounced El Paso as crime-ridden metropolis and the construction of the their barrier as a solution in preventing immigrant crime. But it might be his last. Why? Because the claim is blatantly false. Simply put immigration and crime researchers will tell you that El Paso has never been regarded as one of the most dangerous cities in the States. “El Paso has been considered one of the safest cities, even when El Paso’s sister city of Juárez (Mexico) has been one of the most violent in the world,” said Guadalupe Correa-Cabrera, an associate professor of government at George Mason University, whose expertise includes Mexico-U.S. relations. 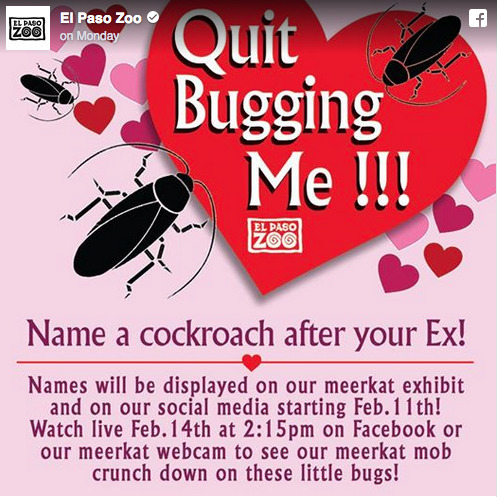 The El Paso Zoo is offering folks an extra special Valentine’s Day gift for one’s ex-boyfriend/ husband or ex-girlfriend/wife. The offer is simple: The zoo will name a cockroach after your ex-loved one and then feed that cockroach to one of the zoo’s meerkats. As you can see . . . El Paso is not only a safe town . . . it has a great sense of humor. So, if you are unhappy with the president spreading falsehoods about this fine community, here is a unique and civil way to show your displeasure. You can message the zoo via their Facebook page with his name, then wait patiently for February 14 to watch the roach get devoured during their “Quit Bugging Me” meerkat event, which will live-stream on Facebook and the zoo’s website. Hopefully if the zoo administrators are as fun-loving as they appear, they will accept these requests in the spirit intended by their innovation promotion. This is also another way to rectify the record that El Paso is not only a very safe town, but also a community that knows how to have some harmless fun. Also . . . if enough “Donald Trump” requests are sent, it will certainly make a lot of meerkats very happy this Valentines Day. The challenge is out El Paso. We’re anxious to see if you accept the gauntlet?